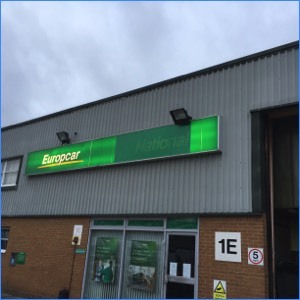 In October 2014 we were asked to provide a solution to an ongoing pigeon problem at a branch of Europcar in Guildford, Surrey. 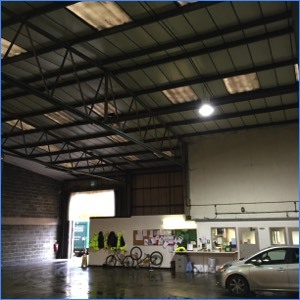 The interior of the building was used as overnight storage for rental vehicles and during the daytime for vehicle washing and valeting. Due to the steady stream of vehicles coming and going during the day the roller shutters had to be kept permanently open during the daytime. Pigeons were flying in through the roller shutter doors and were roosting on the structural steelwork up in the ceiling of the building. This was leading to a build up of pigeon droppings both on the floor of the building (which was potentially hazardous to staff) and on the cars themselves, which was causing damaged paintwork. Pigeons were roosting on the structural steelwork. After surveying the site, we decided that 50mm pigeon netting would be the best form of proofing. 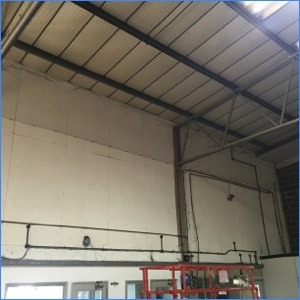 We installed fixings around the perimeter of the interior of the building to a variety of different materials including masonry, plasterboard and steel. Tensioned steel wires were then threaded through these fixings to form a framework to attach the netting to. We designed the framework in a way that allowed us to install the netting in sections, which would cause minimal disruption to the staff. 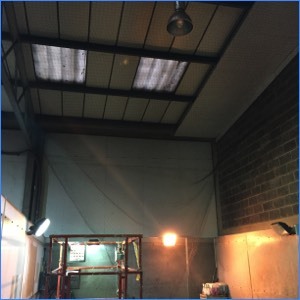 Works were carried out from a scissor lift. Once completed, the netting encompassed all the potential perching and roosting locations within the building. 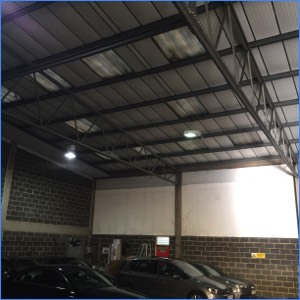 To further proof the building, we also installed stainless steel pigeon spikes along the parapet and to the top on the roller shutter doors at the front of the building. Access holes were cut into the netting to allow the lightbulbs to be changed. Pigeons flying in through the doors were left with no other choice than to turn around and fly back out again!